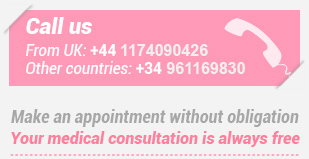 During your visit to international EVA clinic located in Madrid, Dr Marcos Azulay Bentolila, who is the Medical Director and consultant in Fertility, will provide more information about your treatment options to offer you the best chances for successful pregnancy. EVA Clinics have a team of specialist consultants in the field of Fertility and Reproductive Medicine in each clinic in Spain. We are constantly researching and innovating in the field to achieve the best pregnancy rates. One of the major benefits of choosing Eva Fertility clinics is that there are no waiting lists if you are considering starting treatment immediately. You will be able to find out about the chances of success of your treatment and you will have access to our pregnancy rates to learn more about your particular case. At EVA Clinics we are committed to help you achieve your dream of a family. You will be given a detailed schedule of fees, with no hidden costs. An international coordinator will guide you through the entire process and will offer personalized attention 24/7 in their own language. We are the largest European network of Assisted Reproduction clinics with more than 60 Eva fertility clinics across Spain, which allows us to perform a large number of treatments and share our knowledge and expertise. We have a team of professionals with extensive specialised experience in Reproductive Medicine who undergo continuous training and are up-to-date with the latest techniques in fertility diagnosis and treatment. A multidisciplinary team of professionals will take great care in providing the best possible physical matches between egg/sperm donors and recipients, as we understand the importance to you, to be physically matched with highly appropriate donors. Fertility treatments in Spain are well regulated. Egg donation was first authorized by Spanish legislation in 1988 (35 / 1988 Act, 22 November) and must be voluntary, anonymous and altruistic. Our Gamete Donation Programme is based on a continuous flow of donors. Our Bank has a wide range of donors from every section of the community. You will be assigned a personal coordinator who will guide you through the entire process so that you don’t feel lost. We put at your disposal all the facilities so you can receive all the necessary information at any time. Modern life can be challenging and often stressful. We are committed to streamline the whole process for you. Your treatment will be designed to minimise the number of days and length of your stay in Madrid. Our Eva Fertility Clinic in Madrid is a modern, purpose-built clinic, with state-of-the- art facilities and with the latest technology. Travelling to Spain is very easy as there are many budget airlines, with regular flights to Madrid. We believe in continuous learning and knowledge sharing, that’s why we developed a Master’s Degree Programme in cooperation with the Jaume I University in Spain. Eva Fertility Clinics has obtained the Certificate of Treatment Transparency accredited by www.whereivf.com and www.eggdonationfriends.com, international portals for fertility patients. Sus datos serán tratados por Fertilitysc, S.L., con el fin de enviarle prospección comercial sobre nuestros productos o servicios. Sus datos son tratados en base al consentimiento prestado mediante el envío de dicho documento. Sus datos personales serán cedidos a otras sociedades de la cadena con el fin de remitirle información comercial sobre los productos y servicios que sean de su interés, ofrecidos por las clínicas. Los usuarios cuyos datos sean objeto de tratamiento podrán ejercitar gratuitamente los derechos de acceso e información, rectificación, cancelación, portabilidad, supresión o, en su caso, oposición de sus datos, en los términos especificados en el Reglamento General de Protección de Datos de Carácter Personal, conforme al procedimiento legalmente establecido. Estos derechos podrán ser ejercidos dirigiendo comunicación por escrito, debidamente firmada, acompañada de fotocopia del DNI, a Fertilitysc, S.L., Carrer del Marquès de Dos Aigües, 7, 46002 Valencia, o a través de la dirección de correo electrónico [email protected] Los datos de los usuarios cuyos datos son tratados, podrán ser conservados mientras que estos no ejerzan los derechos de cancelación u oposición. Asimismo, en caso de considerar vulnerado su derecho a la protección de datos personales, podrá interponer una reclamación ante la Agencia Española de Protección de Datos (www.agpd.es). In accordance with Spanish Organic Law 15/1999 on Personal data protection of December 13th , Fertilitysc S.L through this notice informs “evafertilityclinics.com” users’ web page about personal data protection. Fertilitysc, SL. is registered into the Valencian Commercial Registry, 9634 volume, 6916 Book, sheet 37, page V-154083, 1st entry C.I.F B-98540750. Fertilitysc, SL. makes this web page accessible through hypertext links. The inclusion of links to other web pages does not imply neither their contents’ approval by Fertilitysc, SL nor any kind of association between Fertilitysc, SL. and their owners. Copying, reproducing, communicating, allocating, disclosing this web page contents is forbidden without the prior explicit consent by Fertilitysc, SL. Recreating and storing this web page content is only allowed if its usage and display from a personal computer is strictly necessary. The user can access the web page information without providing any personal information. Nevertheless, in the event that the user wants to make a consultation by email, it will be necessary filling in a form; in this case the personal information provided will be treated and incorporated in a file of which Fertilitysc, SL. is the responsible and addressee, it is located in Calle Roger de Lauria nº 19, 3º, 3 A, Valencia (46002) whose purpose is providing the requested information as well as the benefits connected to its fulfillment. Fertilitysc, SL. is the file’s responsible and it deal with sending commercial offers by email or electronic channels. The interested party can exercise the rights of accessing, rectifying, cancelling and opposition by a written consent addressed to Fertilitysc, SL. (located in Calle Roger de Lauria nº 19, 3º, 3 A, Valencia) or directly sending an email to [email protected]. The request should include the name, last name of the concerned person, a copy of its ID card and the one of its legal representative, as well as a certifying documentation of this request with details about the applicant’s address, the date and its signature and a certifying documentation of the formulated request. If the request does not meet the requirements, its correction will be required. In regards to the right of access, it will be only denied when the request is formulated by someone different from the person affected. No remuneration will be necessary to exercise the rights. Fertilitysc, SL. Has adopted the necessary technical and organizational measures to guarantee the data protection and avoid their alteration, loss, treatment or no authorized access taking into consideration the technology status, the type of the stored data and its possible risks whether arising from human action or the physical and natural medium. Technical and organizational measures will be adopted to reach the basic objective in regards to security such as the confidentiality defined as a limited access to information by no authorized person, the integrity defined as maintaining the reliable information, and the availability defined as the guarantee to access to the information system through the request of an authorized user. Sus datos serán tratados por Fertilitysc, S.L., con el fin de gestionar su duda o cuestión. Sus datos son tratados en base al consentimiento prestado mediante el envío de dicho formulario. Sus datos personales no serán cedidos a terceros, salvo los supuestos previsto en la legislación vigente. Los usuarios cuyos datos sean objeto de tratamiento podrán ejercitar gratuitamente los derechos de acceso e información, rectificación, cancelación, portabilidad, supresión o, en su caso, oposición de sus datos, en los términos especificados en el Reglamento General de Protección de Datos de Carácter Personal, conforme al procedimiento legalmente establecido. Estos derechos podrán ser ejercidos dirigiendo comunicación por escrito, debidamente firmada, acompañada de fotocopia del DNI, a Fertilitysc, S.L., Carrer del Marquès de Dos Aigües, 7, 46002 Valencia, o a través de la dirección de correo electrónico [email protected] Los datos de los usuarios cuyos datos son tratados, podrán ser conservados mientras que estos no ejerzan los derechos de cancelación u oposición. Asimismo, en caso de considerar vulnerado su derecho a la protección de datos personales, podrá interponer una reclamación ante la Agencia Española de Protección de Datos (www.agpd.es).